Okonjima Bush Camp is smaller and more exclusive than its sister camp Okonjima Plains but enjoys the same wonderful scenery and the conservation ethos of the AfriCat Foundation, set up to protect Namibia’s threatened cheetah, leopard and other wild carnivores. The camp was renovated and updated mid-2015 and guests can enjoy their stay in comfort and privacy. 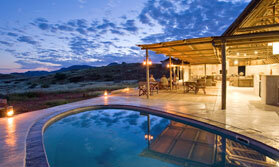 There are just 8 thatched chalets and 1 suite at Okonjima Bush Camp. The chalets are well spaced and built from a combination of clay, canvas and glass, all under a cosy conical, thatch roof. There are two queen-size beds, a telephone to contact reception, leather chairs and a writing desk. Then there is a separate lounge area, or sala, which is open to the front with two comfy couches, mini-bar and tea and coffee station – it’s the perfect place to relax and enjoy a cup of tea. The luxury suite, perfect for honeymooners, has stunning views, floor-to-ceiling glass doors to maximise this, a lounge with fire-place and the en-suite bathroom boasts a bathtub and an outside shower. The main building, curved in shape, is warm, welcoming and covered by thatch. This is where you will find the dining area, lounge and bar and there are no less than 4 indoor fireplaces ensuring you will be cosy on a chilly evening. The building is designed to curve around the manicured lawn and small waterhole to the front. To the side of the building you will find the pool and sun loungers, just the place to rest and relax between activities. Open: Okonjima Bush Camp is open year round. Location: The camp is located on the AfriCat Foundation reserve in the Central Highlands. Rooms: There are 8 gorgeous thatched chalets and one honeymoon suite. All chalets have 2 queen size beds, en-suite bathroom and an outside, open-fronted lapa which has comfy couches, mini-bar and a tea and coffee station. The honeymoon suite also has a bath and an outdoor shower. Activities: The big cats are the main attraction at Okonjima. If you stay two nights you will have a good chance of getting close to the big cats at the AfriCat Information and Carnivore Care Centre. You can go for on special leopard sighting trips and game drives in the reserve and take guided nature walks. Facilities: The main building is curved in shape and looks out onto a small waterhole. It houses a spacious lounge with various seating areas, the bar and dining area. Dining also takes place al-fresco weather permitting. To the side of the main area is a pool. Dining: Meals can be taken communally or at separate tables. Children: Children 12 and above are welcome at Okonjima Bush Camp. Communication: There is mobile phone reception in the rooms and in the main areas. Each room has a telephone with internal lines only. WiFi is available in the main area.